This week, six of the iconic Lewis Chessmen went on display at Lews Castle in Stornoway as part of a long-term loan from the British Museum. To celebrate, we're taking a look at five things you should know about these medieval masterpieces. The Lewis Chessmen on a chess board. The Lewis Chessmen are some of the most well-travelled objects in the whole of the British Museum’s collection. Many museums request them for loan to their exhibitions. Since 1995, various pieces have been shown in over 20 exhibitions, so hundreds of thousands – possibly millions – of people have been able to see them, all around the world. Their characterful expressions are instantly appealing, from the queens looking – well, worried? – to berserker warriors biting their shields! A selection of the Lewis Chessmen on display at Aberdeen Art Gallery in 2011. To celebrate six of these miniature medieval masterpieces going on long-term loan to Museum nan Eilean on Stornoway, here are five facts – and a potted history of their display. The Chessmen are part of a hoard that was found in a sand dune at Uig Bay on the Isle of Lewis in Scotland. It’s thought that they might have belonged to a trader who was travelling from Norway to Ireland to sell them, sometime between AD 1150 and 1200. 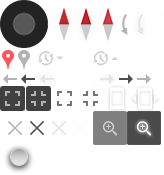 This is likely since there are enough pieces for four distinct sets (although some pieces are missing, as there are 93 known existing pieces). However, no one can be sure when or why they were deposited. Various stories have evolved to explain why they were buried, and how they were discovered. All that is certain is that they were found some time before 11 April 1831, when they were exhibited in Edinburgh at the Society of Antiquaries for Scotland. The way the Chessmen have been displayed and described at the British Museum has changed quite a bit since they were first acquired between November 1831 and January 1832. 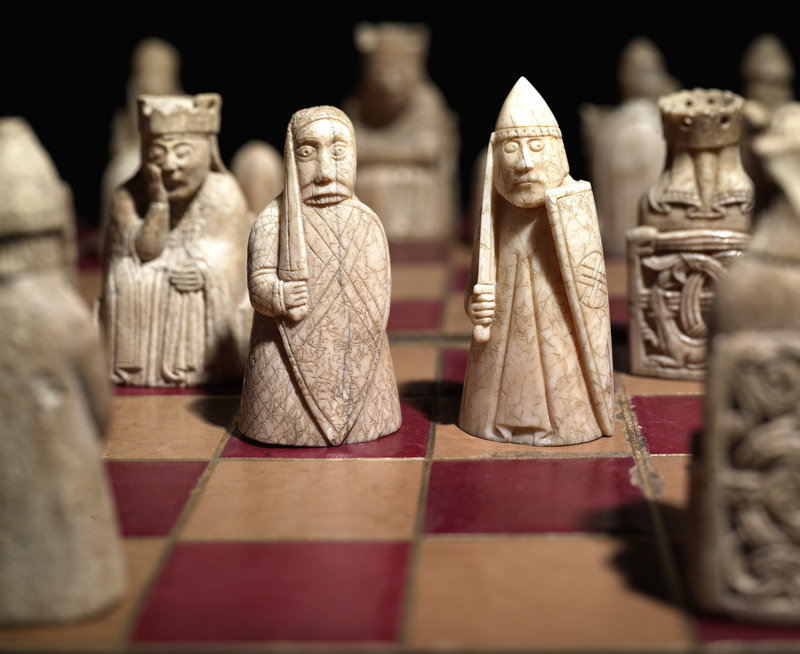 I am interested in the story of the chessmen at the British Museum and how they have become some of the most well-known and loved medieval objects in the collection. The Lewis Chessmen formed some of the first medieval antiquities in the Museum. At the time, the Museum displayed and acquired more objects from classical Greece, Rome and ancient Egypt than from medieval Europe – medieval and British archaeological objects were regarded by many as curiosities. In the 1830s there was no dedicated department or curator for medieval collections, so they became part of the (rather vaguely named) Department of Antiquities. Early displays show this approach – an 1867 ‘Guide to the Exhibition Rooms of the Departments of Natural History and Antiquities’ doesn’t describe the medieval collection. A contemporary map, however, shows that there was a ‘British and Medieval Room’ (today’s Room 69). The Lewis Chessmen were initially displayed with other ivory objects, and were then displayed as gaming pieces. An 1871 guide to the ‘British and Medieval Room’ describes a flat case which contains ‘specimens of sculpture… mirror-cases, combs, chessmen and draughtsmen.’ By 1890 the chessmen had been moved to a case titled ‘Objects used in games’ and the guidebook described them as, ‘a very remarkable set of chessmen, of about the middle of the 12th century, made of walrus tusk and found in the Island of Lewis, Hebrides.’ A photo of the room from 1875 shows a corner of a case where we can spot some of the chessmen. They are standing in a long line across the middle of the case, which looks like it contains ivory mirror cases. The Museum’s Medieval Gallery in 1875. Photo: Frederick York. The chess pieces’ renown also grew from publications and plaster casts which people could buy and take home. These plaster casts of ivory carvings were known as ‘Fictile ivories’ and copies of the chess pieces were owned by many museums, including the Victoria and Albert Museum, which had 16 plaster casts of them in 1872. Plaster casts went as far afield at the Metropolitan Museum of Art in New York and the Technological Museum in Sydney (now the Powerhouse Museum). Today the Lewis Chessmen have been replicated in many different ways. As well as the aforementioned Harry Potter cameo, they’ve also appeared in the manga graphic novel Professor Munakata’s British Museum Adventure and as a giant Lego sculpture made up of over 90,000 bricks, created at the National Museum of Scotland. Curator Naomi has even been sent photos of them recreated in cake by members of the public! New 3D scans of some of the chessmen let visitors move the pieces around and enjoy them in a new way. The Lewis Chessmen as featured in Hoshino Yukinobu’s manga Professor Munakata’s British Museum Adventure. Whatever the future holds for their display, the Lewis Chessmen will continue to delight and enthrall visitors in London, Lewis and all over the world! You can see six of the Lewis Chessmen at the Museum nan Eilean in Lews Castle in Stornoway on the Isle of Lewis. You can also see selections of the Lewis Chessmen in Room 40 at the British Museum and at National Museums Scotland in Edinburgh.